This article covers how to finalize your course or individual students. Both you and the registrar can finalize the course. In case you need to make changes after that happens, the registrar will need to first unfinalize the course. You finalize a course when it is finished—typically at the end of the term, though there are plenty of situations where you might need to finalize at a different time. When you finalize a course, this action also finalizes all the students in that course. You finalize individual students when it is time to make the course and a student's grade(s) part of his permanent academic record. Again, this usually happens at the end of the term. Some cases in which you'd finalize an individual student include a withdrawal after the course add/drop date or an Incomplete. You can finalize the course or a student at any point in the course's lifecycle. You submit your students' grades as part of their permanent academic records. You lock the course to any further changes—both to course content and to student coursework. If you finalize a student (and not the course), you lock that student's coursework to any further changes. Finalizing individual students: The student's grades are submitted to his permanent academic record, updating his transcript, grade report, and statistics like earned credits and GPA. It also closes him out of the course, so he can no longer submit assignments, take tests, and so on. When you finalize an Incomplete student, you can add exceptions for availability dates for the coursework, which permits him access to those assignments after he is finalized. Finalizing the course: The course is closed down to all activity and updates. You can no longer add assignments, change settings, and so forth. Finalizing all students, but not the course: You can continue to update the course content, settings, and details. Check all students lets you finalize all students without finalizing the course. If you need to unfinalize a student, un-check his name. 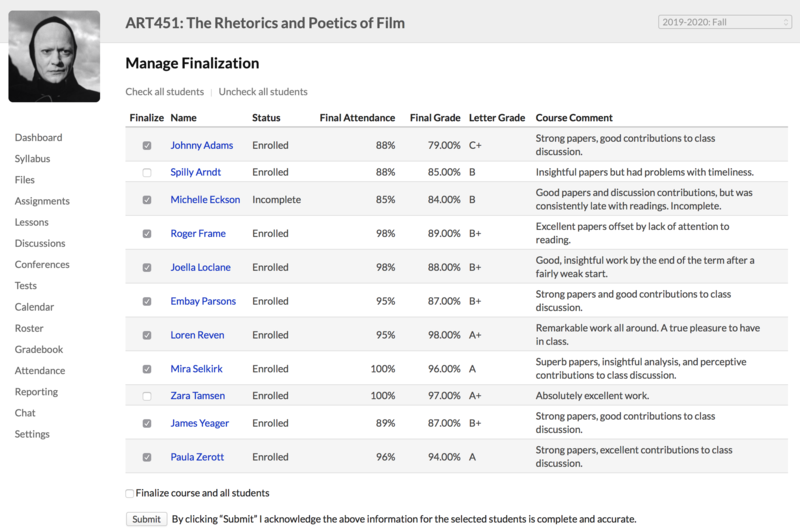 Finalized student grades are now part of their grade reports, transcripts, and other academic records. appears in various places in the course pages (next to certain settings on Course > Info, for example) or next to the student's name. If you’ve only finalized students, you can come back to this screen at any time to finalize other students or the entire course. If you've finalized an incomplete student, read this article to learn how to enter grades for her or mark her complete. If you finalize the course, you'll need to have the registrar unfinalize it should you need to make further changes. Where do I finalize my course? And can I unfinalize it?